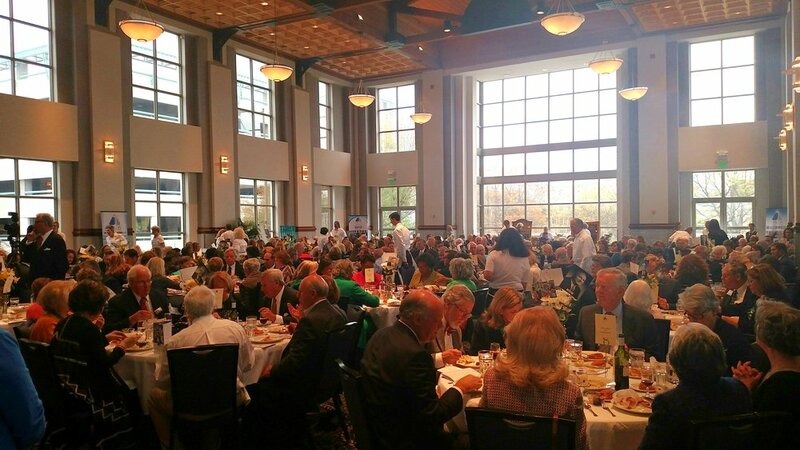 A sold-out affair of nearly 350 guests, family, friends, and volunteers gathered for a festive afternoon in support of MACOA and Meals on Wheels on Sunday, March 3rd downtown at the Alabama Activity Center. Montgomery’s best chefs, caterers, and food professionals again prepared and shared their gourmet dishes for all to enjoy. The menu and chefs were coordinated by Al Steineker, owner of The King’s Table Catering, who for the 18th year worked to ensure all enjoyed a feast of flavors and cuisines to fulfill every appetite and Gary Garner helped serve and station of the items on the day of the event. The Presenting Sponsors for the 25th Annual Culinary Caper were Cathy Caddell and Charlie Warnke and Caddell Construction. Supporting Sponsors included Baptist Health, Knox Kershaw, Inc., United Food and Fuel CITGO, and Warren Averett, LLC. There were also 13 additional sponsors who generously gave to help us raise over $98,000 to support our mission and progress for seniors! Judd Davis of WSFA 12 News served as the Host and guests enjoyed the entertainment of Brian Brantley throughout the afternoon while Rabbi Scott Looper of Temple Beth Or Montgomery offered the Invocation. In addition guests had nearly 190 silent auction items to bid on from trips, to jewelry, gourmet baskets, home décor, gift cards, trips, and much more. Another highlight was The Fifth Annual Rick Heinzman Memorial Meals on Wheels Award presented to Frazer Memorial United Methodist Church for their long time support of MACOA over the years and their partnership as a generous funder and Corporate Route Partner delivering Meals on Wheels. The Culinary Caper was chaired by Cathy Caddell, MACOA Immediate Past Board Chairman. Additional Committee members included Chacolby Burns-Johnson, Larry Carter, Angela Crosby, Sandra Dossett, Barbara Duke, Gary Garner, Jake Kyser, Felicia Long, Deborah Manasco, Jason Manasco, Donna Marietta, Roy McAuley, Esther Miller, Al Steineker, Marie Thurman, and Clare Weil. Thank you to all chefs, volunteer servers, entertainers, silent auction contributors, raffle contributors, in-kind services donors, the Board, community, and staff who helped make the Culinary Caper charity benefit a success for seniors! Mark your calendars now for the 26th Annual Culinary Caper to be held on Sunday, March 1, 2020. Large outdoor entertainment spaces with hot tub, Easy access to famous Jackson Hole fine dining and entertainment areas. A spectacular five-bedroom, seven-bathroom home in Jackson Hole, WY., overlooking the Teton Valley- magnificent view. Three cars are available for use, two of which will be parked at the airport ready to go. Old Town Creek Farm offers the ultimate outdoor experience in the heart of Alabama's Black Belt. 1600 acres, located in Hardaway, Alabama, boasts an abundance of native trophy whitetail and turkey. If you listen carefully, you can hear the whistle of a quail while fishing for bream and large-mouth bass in the pond. Old Town Creek hosts corporate and social events. The beauty of Old Town Creek’s property makes for a perfect setting for a hunt! $5.00 per ticket for an opportunity to win $1,000 worth of gift cards to Popular restaurants throughout the River Region. Thank you to our participating partner restaurants. Final Restaurants to be added by late February! A sold-out affair of nearly 350 guests, family, friends, and volunteers gathered for a festive afternoon in support of MACOA and Meals on Wheels on Sunday, March 4th downtown at the Alabama Activity Center. Montgomery’s best chefs, caterers, and food professionals again prepared and shared their gourmet dishes for all to enjoy. The menu and chefs were coordinated by Al Steineker, owner of The King’s Table Catering, who for the 18th year worked to ensure all enjoyed a feast of flavors and cuisines to fulfill every appetite. The Presenting Sponsor for the 24th Annual Culinary Caper was Caddell Construction. There were also 16 additional sponsors who generously gave to help us raise over $82,926 to support our mission and progress for seniors! Susan Woody served as the MC and guests enjoyed the entertainment of Brian Brantley throughout the afternoon while Revered Larry Bryars of Frazer Memorial United Methodist Church offered the Invocation. In addition guests had over 162 silent auction items to bid on from trips, to jewelry, gourmet baskets, home décor, gift cards, and much more. Another highlight was The Fourth Annual Rick Heinzman Memorial Meals on Wheels Award presented to Reverend Robert Wisnewski of St. John’s Episcopal Church for their long time support of MACOA over the years and their partnership to allow use of their church during a critical time during MACOA’s kitchen renovation. The Culinary Caper was Co-Chaired by MACOA Board Members Cathy Caddell and Paul Scott. Additional Committee members included Dottie Blair, Chacolby Burns-Johnson, Dory Hector, Brenda Hellums, Deborah Manasco, Jason Manasco, Donna Marietta, Esther Miller, Al Steineker, Joy Skelton, Marie Thurman and Jim Weinstock all who worked diligently on the event. Thank you to all chefs, volunteer servers, entertainers, silent auction contributors, raffle contributors, in-kind services donors, the Board, community, and staff who helped make the Culinary Caper charity benefit a success for seniors! Mark your calendars now for the milestone 25th Annual Culinary Caper to be held on Sunday, March 3, 2019. Turner Insurance and Bonding Co.